The Abandoned by Paul Gallico. 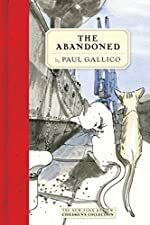 Review: Two stray cats, one adventure, and danger around every corner face Peter in The Abandoned by Paul Gallico. First, the main character is an eight-year old boy named Peter. His father is a Colonel in the army and his Mother is always busy and out places so he is stuck with his nanny. Peter loves cats. The only problem is that his nanny doesn't like cats so he cannot keep one. Peter lives in a small flat in something called a Mews. The house is off of Cavendish Square in London. The story begins as Peter is waking up after being knocked out in an accident. When he is at the hospital, strange things happen and once he gets ahold of himself, he sees that he is not in the hospital anymore and he is a cat. This changes Peter's life completely and he is faced with new challenges, a new adventure, and a new friend. Although I did not enjoy The Abandoned, people with imagination, lots of creativity, and who like fantasy books and like cats would love it. I like the setting of the story because it kind of goes with the mood of the book. The mood of the book is sad at some times and happy at other times. Whenever the mood changes, the setting changes. The setting is well explained and so are the characters. It is well written would definitely appeal to that audience. I recommend this book to any fan of fantasy. Review written by Justin (6th grade student). We would like to thank Media Masters Publicity for providing a copy of The Abandoned for this review. Have you read The Abandoned? How would you rate it?